We’re really lucky this year, to have Refraction as a sponsor. They’re a unique coworking space in Reston, Virginia – and they’ve opened their doors to us for UPickVG IV, and allowed us to broadcast straight from their event space! When you tune in to see UPickVG IV, you’re seeing the awesome space provided to us by Refraction. Refraction is a coworking community that brings together software companies, other tech-enabled businesses, non-profits, and art under the same roof. Refraction’s guiding belief is that empathy is the currency of innovation. Said another way: when you’re better able to understand the community around your organization, you are better able to serve your customers and better able to gain and retain top talent. We foster an empathetic, innovative and collaborative work environment by bringing together these groups and hosting events geared toward their growth. The space at Refractions consists of coworking desks, offices, meeting rooms, and an event/maker space. And they have many exciting free and paid events that are open to the public through Meetup, including speakers on topics such as the Nutrition of Thriving, plus community events like Halo tournaments and monthly Happy Hours. And of course, now they can add “Livestreamed Game-a-thons for Charity” to that list of events! 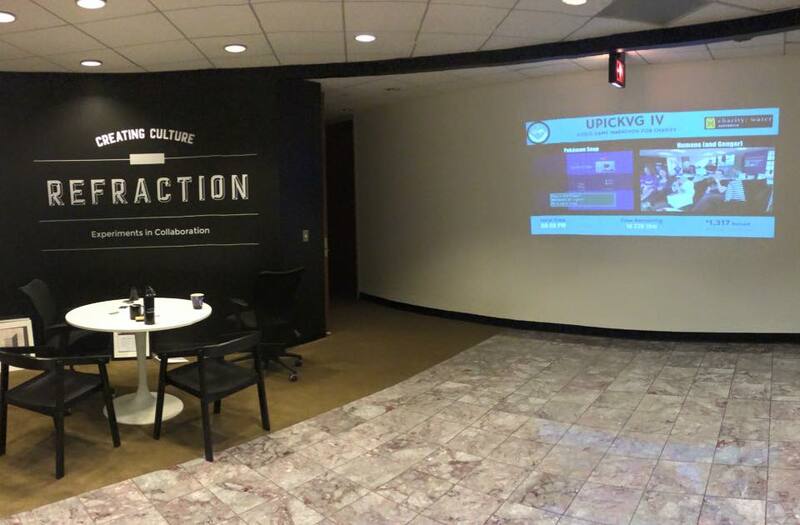 Refraction even has our live feed going on the projector in their entrance-way – while we’re broadcasting from inside Refraction! It’s Refraction-Inception! Oh, and also? Their conference rooms are named after video games. So you can have a meeting in Tetris, Halo, or Portal. How awesome is that? So if you’re in the market for a sweet space to work from in Reston, Virginia, check out Refraction. The folks who use the space are so happy with it, there are hardly ever openings – but you’ll want to get yourself on the waitlist, just in case a spot does open up! And even if you’re not in the market for some coworking space, let Refraction know how much you appreciate their donation of space for UPickVG! 1 Comment on "Sponsor Spotlight: Refraction"